AOBO G8332 - HANGZHOU AOBO TELECOM.,LTD. √ Support ABRing® full-distributed high self-healing loop, with the network self-healing time less than 5ms. √ Support the relevant functions, such as the link aggregation, port rate limit and broadcast storm control. 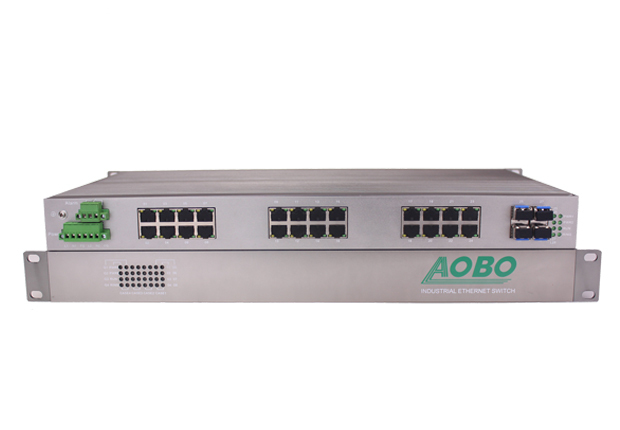 AOBO G8332 series are the 10-Gigabit Ethernet three-layer design program researched and developed by Hangzhou AOBO Telecom Co., Ltd. for meeting the high bandwidth and reliability requirements and are specially suitable for the use in the large industrial network. G8332 series are designed to have the modularized structure and provide a maximum of 4 10-Gigabit Ethernet fiber interfaces and 28 full Gigabit Ethernet ports. The users are allowed to configure the interface quantity of optical or electrical ports flexibly based on the networking demands on site. G8332 series are especially suitable for the application scenarios with the high bandwidth business demands in the fields of the security protection and monitoring, intelligent traffic and industrial automation, such as the video and audio. The specific full-distributed high self-healing loop ABRing® technology realizes the self-healing of the whole network within 5ms and improves the reliability of the industrial network effectively. G8332 series support the static routing, or dynamic three-layer routing functions like RIP and OSPF, rich network management functions, such as VLAN, GVRP, STP/RSTP/MSTP, LACP, IGMP Snooping, GMRP and ACL, and diversified network management methods, including the SNMPv1/v2c/v3, Console, Web and Telnet. This series of switches adopt the IP 40 metal shell and fanless design and are in possession of the proper EMC, therefore being capable of operating stably and reliably for a long time under the extreme adverse temperature range of -40℃-+75℃. √ Support 4 10-Gigabit Ethernet ports and 28 Gigabit Ethernet ports and meet the transmission requirements of the high bandwidth business. √ Support the static routing or dynamic routing protocols, such as the RIPv1/v2, OSPF v2 and BGP. √ Support relevant safety technologies, such as IEEE802.1X, HTTPS, SSH, RADIUS and TACACS+. √ Support the relevant management functions, such as the VLAN, QoS, GVRP, RSTP/MSTP, VRRP, IGMP Snooping, GMRP and ACL. √ Support the several network management methods, such as the SNMPv1/v2c/v3, Console, Telnet and Web. √ Support full-distributed high self-healing loop ABRing® protocol, with the network self-healing time less than 5ms. 2HV: Dual power AC/DC input, 90-240VAC/88~300VDC.